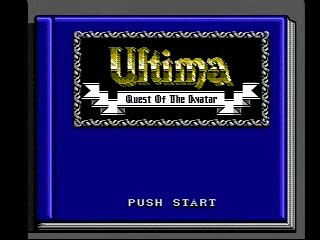 Released by Pony Canyon in 1990, Ultima: Quest of the Avatar is the NES port of the fourth installment of the venerable Ultima series. Given a choice of a wide variety of starting hereos, you perform a wide variety of tasks in whatever order you want to save the land of Britannia. Best time: Single-segment 1:58:41 by Jeff Feasel on 2012-09-21. This run was a beast to plan. Unlike other RPGs I've played, this game is completely non-linear. You have 3 objectives you're working on concurrently (find runes in towns, find stones in dungeons, build virtues and visit shrines) and for each objective the 8 facets of it can be done in any order. Also contributing to the non-linearity is the fact that the game doesn't really require you to level up or buy armor. The strong enemies are not significantly stronger than the weak enemies, so you can beat the game without leveling at all (fighting the fixed encounters needed to get the stones is enough to guarantee you level 4, which is all you need to activate the pirate ships). Armor doesn't cause a significant decrease in damage, so don't bother with it. Middle-tier weapons are sufficient for all the battles, so you don't need much at all beyond your starting equipment. Basically you can do whatever you want in whatever order. This led to a staggering number of possibilities for the route, which I winnowed down until I had several candidates to compare. I would not venture to say that the route I ended up with is optimal. I'm sure an infusion of new ideas will eventually lead to a better route sometime in the future. Here's the plan: Start as the Druid. Only the Druid and Mage have enough MP to cast Quick at low levels, which is essential for doing fast battles. The Mage cannot use any good missile weapons (besides the Wand, which is not used in this run because it is too expensive), so Druid is the only choice. Gather 3 more party members together. It doesn't matter who, so pick the 3 who start with the most lucrative equipment (Fighter, Ranger, Paladin). Sell all the equipment from everybody and do 1 deathwarp (which gives you an additional 400 gold) and you have enough to buy Bows for all 4 party members and Clubs for the 2 people on the front lines. This combination of 4 people with Bows (with the Druid casting Quick at the start of each battle, so everybody gets 2 attacks per round) is enough to make short work of everything in the dungeons. The other thing you need is magic herbs, so you have to hit Moonglow at some point in the early-game. The Fighter is obtained first because the moongates near the Druid's starting position happen to take you to Jhelom. The Ranger is next because he must be obtained before selling off gear or stealing magic herbs (since these lower your virtue and then the Ranger won't join you). The Paladin is obtained last because his town is near Destard, the most convenient entrance to the dungeons. Once the party is assembled and equipped, there are basically 2 ways you can go: Visit the dungeons for stones or visit the towns for runes/virtues. Some of the runes require the Key, which costs 2000 gold. The fastest way to earn gold is to raid the treasure rooms in the dungeons, so it makes sense to do the dungeon crawl before doing the town crawl. All 7 dungeons are connected to each other via the 3 altar rooms (Truth, Love, Courage) located on the bottom-most floors. There are 6 stones in the dungeons (the remaining 2 are found in the outer world). Most of the stones are located in the lower floors, so it makes sense to enter from one dungeon (Destard being fairly quick to get through), go to the bottom floor and warp around between dungeons via the altar rooms until you've got all the stones. It would be really convenient to grab the 3 keys now from the altar rooms, however you can't yet because the white stone isn't available in the dungeons. To get it, you need to make your way into Hythloth and cast the Exit spell to obtain the balloon (which is the only way to reach the white stone). So a 2nd trip into the dungeons is required. I choose to delay the 2nd dungeon trip until later in the game (after the town-crawl is over), but you could do the 2nd trip immediately after getting the white stone if desired. For the 2nd trip you can enter from any of the dungeons and just go straight down to the bottom floor to reach all 3 altar rooms. I enter from Deceit because it's a relatively quick dungeon and its entrance happens to be at a convenient place in the overworld, but there are other options if you want to do the town-/shrine-crawl in a different order. The dungeons are very tricky from a memorization/recall standpoint. Easily the most exhausting part of the run -- navigating without hesitation through a multi-floor maze, all parts of which look exactly alike. A few key points: Walking backwards in some parts can cut down the number of 90-degree turns. When going up/down a ladder your direction is unchanged; when walking out of a fixed encounter, bridge, or altar room your direction becomes the direction you exited; when walking out of a stone room your direction is the way it was when you walked in. You can skip the ladder text upon entering a new floor simply by holding a direction on the d-pad during the floor transition, so for each ladder in the game you must memorize which direction to hold when taking it. After doing the first part of the dungeon crawl you have enough gold to buy the Key and a good weapon (+1 Bow) which will be needed to get the Druid through the Abyss (the final dungeon of the game, which only 1 character can enter). To afford these you must sell off everybody's equipment again (retaining the Club for the Druid). This essentially makes the other characters useless, so you kill them off to avoid them wasting time in battle. For the 2nd dungeon trip the Druid will have the Tremor and Energy spells, so you don't really need the other party members anyway. Besides the stones, you also need to find the 8 runes (hidden in towns), master the 8 virtues (mostly by talking to the right people in towns), visit the 8 shrines, obtain the special items (Horn, Bell, Book, Candle, Skull), and do other miscellaneous tasks (learn Tremor, buy Manroot, get black and white stones). This requires a lot of travelling in the overworld, and there are many possibilities for the order in which things are done. It makes sense to do the balloon-only stuff first (white stone and Candle) since you're already in the balloon when you exit the dungeon. It also makes sense to visit Buccaneer's Den early on because you'll lose virtue by selling your equipment and stealing Manroot (and other herbs) from the magic shop, so this has to be done before the events that raise virtue. It is also good to do Britain early because you have to talk to Lord British in order to reach level 4, which is needed to allow you to donate blood and to make pirate ships appear. So that pretty much locks down the beginning of your path in the overworld. As for the rest of the objectives, there are various constraints to the ordering. Shrines can't be visited until after you've obtained the corresponding runes and done the trigger-events that build up the corresponding virtues. The Horn must come before the Humility shrine. The Valor shrine must be done last because you need to fight 49 random encounters before it. There are 2 events that require the moongates to be in a certain position: entering the Spirituality shrine on the double-full-moon and finding the black stone near Moonglow on the double-new-moon. I found a path between these two points such that if you leave the Spirituality shrine on the double-full-moon you will always end up at Moonglow on the double-new-moon. Depending on how much time elapsed during the first half of the game, you may or may not reach Minoc just in time to do the Spirituality shrine on the double-full-moon. However if you happen to arrive there at the wrong place in the cycle it's no problem because you have to do a bit of grinding anyway to earn the 49 Valor points somewhere during the run. There are 8 virtues tracked on a scale from 0 to 99. You start the game at 50 in all of them. Virtues are raised and lowered in various ways. Honesty is raised by talking to the camp-fire in Yew. Since there is no cool-down period you can just talk to it 15 times in a row to max it out. You lose some Honesty when you steal from the magic herb store and when you sell items for more than half price. You gain Honesty by doing these transactions fairly (however the gaining has a 16-step cool-down counter so you can't just do it over and over). Justice, Honor, Spirituality, and Humility are all raised by the tree in the jail cell in British's Castle. Of these Justice is the limiting factor (since Humility is penalized less than Justice when you steal, Spirituality isn't penalized at all by stealing, and Honor goes up from winning battles). You can talk to the tree 18 times in a row with no cool-down period. Compassion goes up by giving money to the beggars (need 10 of these). Sacrifice goes up by donating blood at a healer (need 9 of these). Both the beggars and the blood donations have a cool-down period requiring 16 steps in the overworld. It makes sense to grind both of these virtues together so your 16 overworld steps can count for both timers. Yew is the fastest place to hit up both a healer and a beggar, however Britain is only slightly slower and it's located at a much more convenient place on the route (since the Compassion shrine happens relatively early on). There is 1 convenient healer located along the route after Britain (in Yew) and 2 convenient beggars located along the route before Britain (Buccaneer's Den and Paws), so you only need to do the beggar/healer combo in Britain 8 times. Valor is raised by fighting random battles. Fixed battles in the dungeons do not count but pirate ships do. You need 49 random battles throughout the course of the run. The rate at which random encounters occur is not random at all. They appear after a counter has gone from 0 to 255. That counter will increase at a slow rate if you're standing, and it will increase at various terrain-dependant rates if you are walking. So the number of random encounters you get during the run is fixed, assuming you always walk the same path and don't hesitate. Even doing the Valor shrine last, the route is short enough that you will not hit 49 encounters without having to grind at least a little bit somewhere in the run. You can snag a few pirate ships (which are dispatched easily using Energy), you can grind a little bit while waiting for the double full-moon for the Spirituality shrine, and if all else fails you can grind near Jhelom right before the Valor shrine. Running away from fights loses Valor, so if you want to avoid a fight cast Blink. The Abyss can only be done with the primary character. Companions are not allowed in (unlike the PC version). There are a lot of battles to be fought, but with a decent range weapon (+1 Bow) and the spells Quick/Tremor/Energy the Druid has no problem getting through the Abyss at level 4 (the minimum level for beating the game). When you become an Avatar your maximum MP gets boosted to 99, so there is plenty of magic to work with. Tremor (40 MP) kills a random number of enemies (between 0 and the number of enemies on screen) so there is some luck involved in using it, but it is amazingly fast when it works well. Energy (22 MP) does a moderate amount of damage to 1 enemy and leaves a 3x3 pool of lava that can potentially end certain battles really fast if you use it in the right spots. Quick (25 MP) allows you two attacks per round (but essentially does nothing the first round). Different battles call for different strategies. Often the strategy depends on how many enemies the initial Tremor kills. Optimal spell usage is really tricky, since every magic point you spend means one extra step you'll have to walk when you're recharging MP after the battle. For example, each use of Tremor means 40 steps of walking (about 13 seconds), so Tremor should only be used when it's going to save that amount of time over other methods. There's no real final boss. You fight doppelgangers of the 8 characters, but with Tremor this battle isn't worse than any of the others. I look forward to the day when somebody else attempts a run of this, because I feel like another person approaching this problem might come up with a radically different solution. Looking back at what I wrote above, the assumptions I made, I can't help but think that any one of these assumptions might be reversed to good effect. For example, you could use the Wand instead of the +1 Bow, which would require less magic use in the Abyss (possibly skipping Tremor). You could use fewer than 4 characters. You could collect more than 4 characters and sell off all their equipment. You could repeatedly deathwarp to Lord British, obtaining 400 gold each time, and use that to buy the Key or good equipment at the start of the run. You could steal treasure chests from town. You could grind for money in a loop in the dungeon (treasure room to stone room and back), exit the dungeon via Hythloth, buy great weapons, get the Key, Tremor, Manroot, and white stone, then go back in the dungeon to get all the stones and keys. You could start as the Mage, get Tremor and Manroot early, then beast through the dungeons solo. You could use more moongates during the town-crawl and then grind the extra valor points using the infinitely-reoccurring encounters near the Humility shrine. Though it leaves me uncertain, I really appreciate the open-endedness of this game from a speedrun standpoint. There are lots of ways to get creative with the game, and I hope that somebody sees this and decides to give it a try.